The summit was almost a disappointment, since it meant that the climb was over. 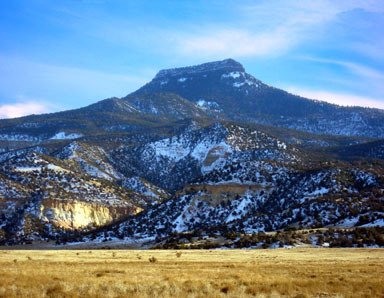 Pedernal means flint in Spanish, and this flat-topped butte in northern New Mexico has long been a source of agate. Natives living nearby during the Pueblo Period (1303-1324 AD) used Pedernal’s stone for arrowheads, scrapers, knives, and spearpoints. 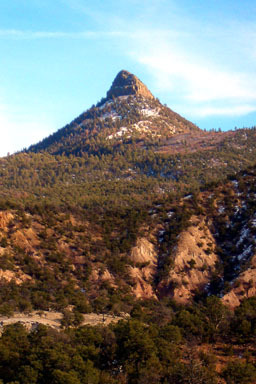 Today, the butte is a well-known landmark in the northern Jemez Mountains, and gained further noteriety when artist Georgia O’Keefe lived nearby and painted the peak. This is the standard route up Cerro Pedernal, and it provides a short hike to a spectacular summit. The tour makes a nice day trip from Santa Fe and environs. 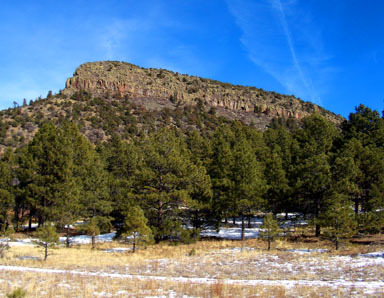 The initial approach to the peak is up a 4WD road surrounded by the intoxicating smell of piñyon pines, then the peak requires a short, steep hike, a short, Class 3 wall, and a narrow, exposed trail to the summit. You can climb Pedernal in all seasons including winter, but the Class 3 wall and upper trail will be dangerous after heavy winter storms. There has been at least one fatality on this peak. Start at the Temolime Trailhead at 7,980 feet. Go 1.1 miles east up Temolime Canyon on the 4WD road, crossing from the canyon’s north side to its south side enroute. At 8,220 feet, turn sharply north on the main road, cross back to the canyon’s north side and climb 0.5 mile north above the canyon. When you reach a meadow at 8,480 feet, you will have an open view of the upper peak. Just beyond this meadow, an old, blocked road goes straight ahead. Staying on the main road here, turn left, contour 0.5 mile west, switchback hard to the east at an intersection at 8,680 feet, and continue on the road for another 0.8 mile to some large meadows at 9,030 feet. Your approach on the road is over. From these meadows you will have a clear view of the peak’s upper northwest face and its barrier cliff. On first glance, the barrier cliff may appear to be continuous for the length of the face, but a closer inspection will reveal a passage through the cliff. Look for a 20-foot wide, black cave opening midway in the face. 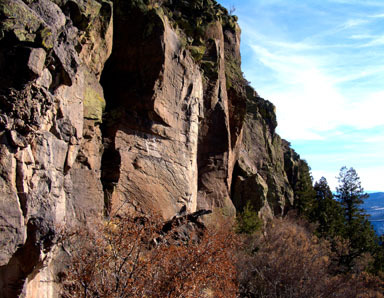 The route through the cliff is 150 feet northwest (left) of the cave. Leave the road, and hike up the steep slope to the barrier cliff by a route of your choice. 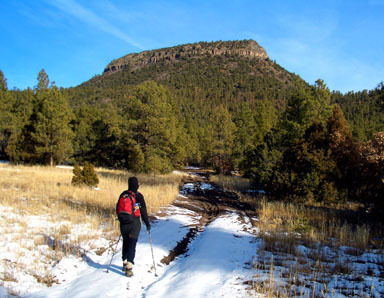 There are many use trails in this area, so take your pick. 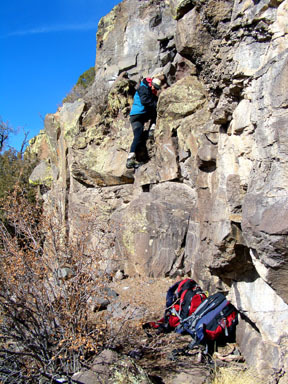 Hike along the base of the cliff until you find the key passage, which is a 12-foot high, Class 3 wall with a right-sloping ramp above it. There is also an old painted arrow on the rock here. Climb the 12-foot high wall, which requires two Class 3 sequences that have a secure stance between them. This is the crux of the route. Above the Class 3 wall, follow the use trail up a ramp to the right, and continue up the sometimes exposed trail to the ridge above. 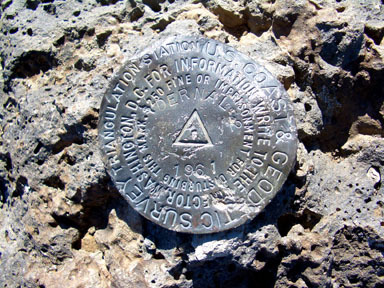 Hike 200 yards northwest on the ridge to the highest point. From your Pedernal perch you can see the entire southern Sangre de Cristo Range from the Fourteener Culebra in Colorado to the peaks above Santa Fe. This view includes Wheeler Peak - New Mexico’s highest peak - the Truchas Peaks, and Santa Fe Baldy. To the north you can see the southern San Juans and the La Garitas in Colorado. Scanning farther to the west, you can see the main San Juans, and even the La Platas above Durango, Colorado. No other summit offers this unique view.